Chair features a blow-molded seat and back with a steel stacking frame. Table features a blow-molded top and steel folding frame. Lifetime children's stacking chairs are made of high-impact polyethylene, contoured for comfort, and designed for durability. Powder-coated tubing increases strength and stability through the life of your child's chair. Lifetime children's stacking chairs are lightweight, easy to clean, and can be used indoor or out for a variety of projects; from snack time, to finger-painting, or games. The convenient design allows you to stack multiple chairs together for easy storage. The chairs are durable and perfect for your child's play or lunch time. 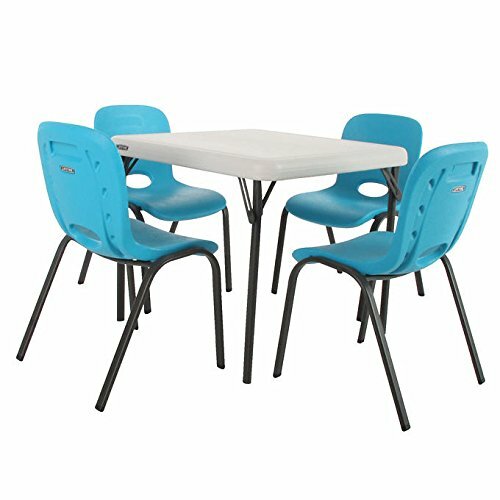 Lifetime children's square folding tables are constructed of high-density polyethylene and are perfect for all sorts of childhood projects and games. They will not crack, chip or peel, and are built for indoor and outdoor use. The patented steel frame design provides a sturdy foundation and is protected with a powder-coated, weather-resistant finish. Perfect for young kids, Lifetime children's square folding tables are ideal for painting, playdough, or their next snack time. If you have any questions about this product by Lifetime Kids, contact us by completing and submitting the form below. If you are looking for a specif part number, please include it with your message.